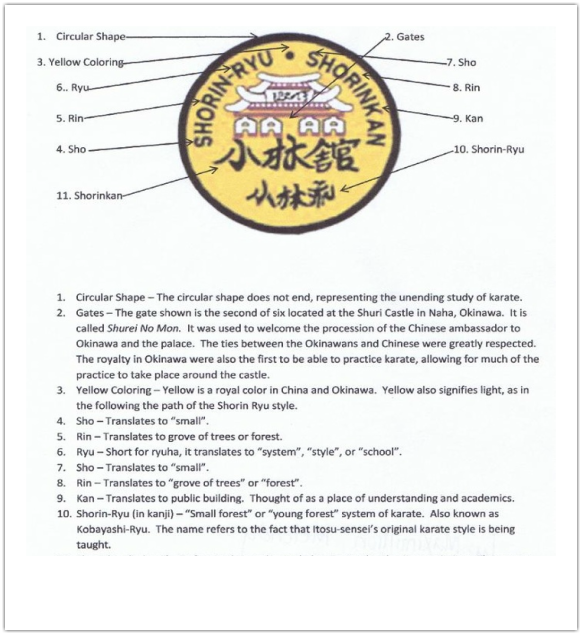 Shorin-ryu Shorinkan was started by the late Sensei Shugoro Nakazato in 1975 to promote and preserve the Okinawan Traditional martial art know as Shorin-ryu. Shorin-ryu, is one of the primary schools of Traditional Okinawan karate. All Okinawan karate originated from Okinawan Te, and over the years ideas and concepts from Chinese Kenpo were blended in, not copied, made to meet the logic and quick short movements that is distinctly Okinawan. Sensei Shugoro Nakazato was taught by Sensei Choshin Chibana, who had learned Shuri-te from Ankō Itosu. Over time Okinawan Te started to be named based on the cities where it was practiced. Anko Itosu practiced in Shurie therefor he taught Shuri-te. Sensei Chibana renamed Shuri-te to "Shorin-Ryu" (or "the small forest style") in 1928. Sense Shugoro Nakazato spent a lifetime promoting and preserving what he learned from Sensei Chibana, and after his passing his son Sensei Minuro Nakazato now heads the Shorin-ryu Shorinkan Association. Under Sensei Shugoro Nakazato, Shorinkan has spread to every country and is one of the most prestigous Traditional Karate Organizations. Our Karate organization is recgonized by the patch which Sensei Nakazato designed.